Cinema therapy, also called film therapy or movie therapy, is a process where a therapist prescribes movies to help their patient explore their psyches. Although few therapists actually center their practices around cinema therapy, movies have long been a tool to help those in therapy achieve their goals. Books with such titles as Rent Two Films and Let’s Talk in the Morning and Hollywood Endings And How To Get One can be found in the self-help section of your local bookstore. There are many types and definitions of cinema therapy, just as there are many different applications. For example, the Chicago Institute for the Moving Image (CIMI) helps people seeking therapy for depression or other serious psychiatric illnesses, including schizophrenia or amnesia, to write, produce, and direct their own movies. Part of the focus of this site is to review movies for their therapeutic value. 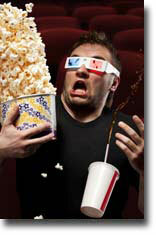 Another key point of this site is to explore other practical aspects of using movies as therapy. For example, prescribing movies for yourself just as you would practice self-hypnosis or meditation. The concept of using movie watching as a therapy is not new. In fact, films have been used as therapy since they were first conceived. In understanding the long history of using movies as therapy, it might help to understand what therapy is. In the strictest sense of the word, therapy is a therapeutic relationship between an individual, couple, or family and a mental health professional, usually a licensed psychotherapist (sometimes called a Marriage Family Therapist). However, there are many other types of therapy, such as massage therapy and physical therapy. Almost every type of these therapies can be done alone, without the presence of a therapist. However, this is not really considered to be therapy, just like doing cognitive behavioral therapy yourself is not technically therapy because there is no therapeutic relationship. As we all know, many things do not necessarily require a therapist in order to be therapeutic. Watching a movie is one of them. Although discussing the aspects of a movie with your therapist can be therapeutically rewarding, there are personal moments that are experienced when watching a movie that can defy explanation. These are the films that move us and change are lives. Most of us have them – and id we are lucky – we have many of them. As an exercise, sit down and write out the 10 best films you have ever seen. Then perform a mini Thematic Content Analysis – that is look for themes that the movies have in order to determine why they have meaning to you. If you are fortunate and you are in therapy, this is where the cinema therapy comes in. During your next session, discuss with your therapist the thoughts and feelings that came up for you when you saw your last movie. Or talk about how one of you favorite films changed your life and made you look at your deepest belief systems. Below is my list of my favorite 10 movies, what I like to call the movies I would take with me if I was stranded on a desert island with electricity, a DVD player, and a television. What are your favorite 10 movies? When is the last time you watched them? Who is your favorite movie character and why? Get out your journal and make some notes after you watch your next film. Your sure to have fun and experience some self-discovery doing it.